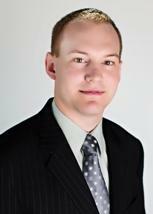 John joined our firm in 2010, after having clerked with us the previous summer. John graduated from Southeast Missouri State University in 2007. While at Southeast, John was involved in many student organizations, and in his senior year was recognized as the Man of the Year for Sigma Nu International Fraternity. John then went on to receive his law degree from the University of Virginia School of Law. At Virginia, John was a managing editor for the Journal of Law and Politics. John is licensed to practice law in both Missouri and Texas. John focuses his practice on bankruptcy, estate planning, elder law, family law, personal injury and civil appeals.